Breakfast has always been one of my favorite meals of the day. Strangely enough, it is the meal that I am least enthusiastic about. Probably because I want to get something into my stomach as soon as possible with the least amount of work. On occasion, my husband will persuade me to make something a little different for Sunday breakfast. Cinnamon rolls are a favorite in my household. Really though, who doesn't like them!? 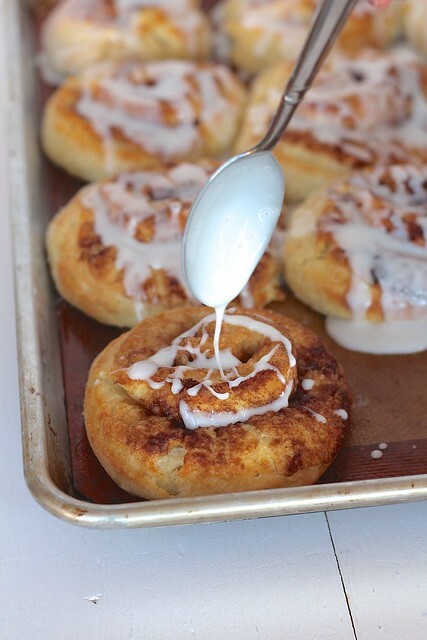 I have made all sorts of cinnamon rolls, but this recipe is the one I always turn to first. You don't have to wait for hours for the dough to rise. Occasionally with recipes, taking the short cut will yield a less than satisfying result. 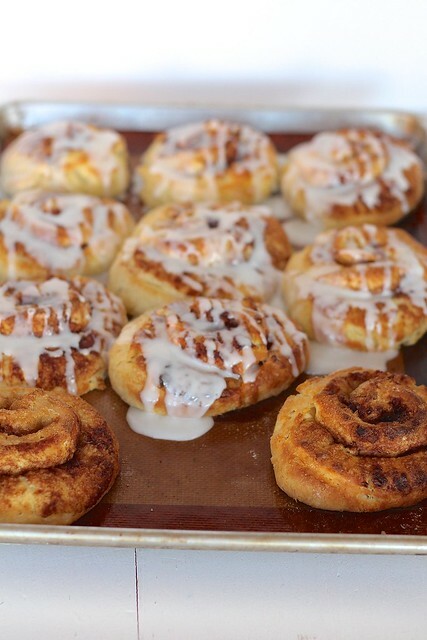 These cinnamon rolls are definitely an exception. They are soft, melt in your mouth goodness. This is something you can throw together and have on the table in under an hour. My kids don't get too upset waiting to eat for that short amount of time! The baking time leaves you time to cook up some eggs or another side dish. You can put whatever filling you prefer in the middle. Fresh fruit would be great! Or nuts and raisins... Whatever you'd like! Preheat the oven to 400 degrees F. Have ready a parchment paper, or silpat lined baking sheet. Brush the melted butter over the surface of the rectangle-shaped dough. Spread the brown sugar evenly over the top, then sprinkle with cinnamon. Place any other desired filling on top of the sugar. From the long side, roll the dough up jelly roll style to form a log. Cut the log into 1-inch thick rolls and place on the prepared baking sheet about an inch apart. Bake the rolls until firm to the touch and light golden brown, about 15-20 minutes. Meanwhile, whisk the glaze ingredients together until smooth and creamy. When the rolls are fresh from the oven, drizzle or smear the glaze over each roll. Serve and enjoy.